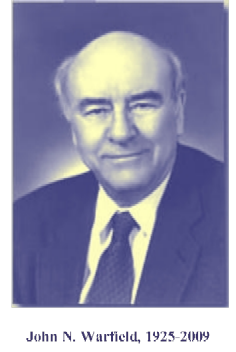 John Warfield's retrospective on Systems Science -- "Autobiographical Retrospectives: Discovering Systems Science" -- was published by Dr. George J. Klir, editor of the International Journal of General Systems 32(6), December 2003. For a free copy of the manuscript click here. For a copy of the published version (fee applies) click here. As Warfield states in the introduction, "...my motivation was to develop a systems science: a science that extended all the way from its foundations through a sufficient number of applications to provide empirical evidence that the science was properly constructed and was very functional; a science that could withstand the most aggressive challenge. In Understanding Complexity: Thought and Behavior, Dr. Warfield defines Interactive Management as: "A system of management invented explicitly to apply to the management of complexity. It is intended to be applied intermittently in organizations to enable those organizations to cope with issues or situations whose scope is beyond that of the normal type of problem that organizations can readily be solved." NB: The George Mason website agreed to provide a place for the Exhibits references in the article as a supplement to the text. Among other things, the Exhibits contain numerous pictures of individuals whose work contributes in some way to the development of systems science. This site is maintained by the Warfield Intellectual Property Trust. For more information about the Trust, or if you have comments about this site, please use the Contact Form.